It was a warm Colorado evening on May 28th, 2009 when, for the first time, I left a comment on IncomeDiary.com. 18 minutes later, Michael replied. Over the next two years, I left more comments, asked to interview him, was invited to D.C. to meet him, and today I’m writing for him. Since then, I’ve made a game out of leaving comments on big sites with 100+ comments per post. My aim is always the same, to get the blogger to reply. Because if they do, I know that they at least know that I exist. At that point I can send an email and expect them to recognize my name. With a fresh perspective as the blog post author, here are 10 tips on getting bloggers to reply to your comments. The point of the comment section is to create a forum under the blog post. It’s like an extension of the original topic, a place where readers can go to get more opinions. To effectively contribute to the original topic, you need to leave an insightful comment. Adding your opinion does two things. (1) It shows that you read and thought about the concepts in the post. (2) It adds value to post. If the post is a tutorial and you have a bonus tip, offer up your advice in the comments. Who knows, you might even enlighten the blogger. They’ll remember that. Answer the question they ask at the end of the post. Lots of bloggers ask questions at the end of the post to stir up discussion. But very few people actually answer that question. There’s a reason they asked it. The most important thing you can do when commenting is leave a comment worth reading. I left that comment on Online Business Success in 2010 with a question that was spurred by the topic of the post. The best way to get somebody’s attention is to use their name. Addressing the blogger by name also shows that you recognize who wrote the post, which, for people who write for other sites, is nice. Simply dropping a question within your comment dramatically increases the likelihood of the blogger responding. It’s a lot easier to reply to a question than a normal comment. In the same way that the blogger wants valuable comments, they don’t want to clutter up the comment area with pointless replies. So, sometimes they only respond to questions. If a blog post has a lot of answered questions in the comments area, the blogger will look good. Asking a question is like adding a call to action to your comment. Michael replied to that comment on Yaro Starak’s Interview because it was simple to answer. 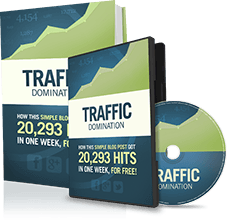 Want to boost your reply rate to nearly 100%? Ask the blogger about their product or service. It shows that you took some time to research their products. Perhaps the best way to thank a blogger for their free information is to take the time to find out if their paid products are right for you. Their reply might make them money. If you hint that you might be a new customer, you have priority. It brings attention to your comment and their product. When I read a post on a big blog, I almost always scroll through the comments to find the comments that the author responded to. In turn, the author’s reply actually gets me to read about their product. When they do the Q&A at the end of webinars, the host always gives preference to the questions about the product they’re selling. One of the best compliments you can give a blogger is to actually implement something they recommend. Bloggers recognize that the more you implement their advice, the more you’ll benefit from their blog, and the more likely you’ll be to purchase something from them. So, get in the habit of implementing the things you read about. It’ll help you two-fold. When I go through the comments, the “thanks for the tips” and “that’s great advice” comments start to get redundant. I appreciate them and they make this gig rewarding. It’s just that I don’t have a chance to learn from you unless you challenge my ideas. I know a lot of bloggers feel this way. What we really want is someone who politely challenges our advice, someone who adds value to the discussion by giving an opposing viewpoint. The other nice thing about leaving your disputes in the comments is that it gives the blogger an opportunity to address it. Most of the time when someone disagrees with something, they leave. I respect the person who is bold enough to stand up for their thoughts, especially if they have a solid argument. When somebody leaves a comment, it’s almost always a new comment, instead of a reply to an existing one. From a design standpoint, replies stick out because they’re threaded. Instead of just addressing the blogger, you’re also acknowledging another reader. Plus, bloggers like when they’re readers start to get to know one another. It makes the blog sticky. Start replying to people’s comments more often than simply adding a new one. 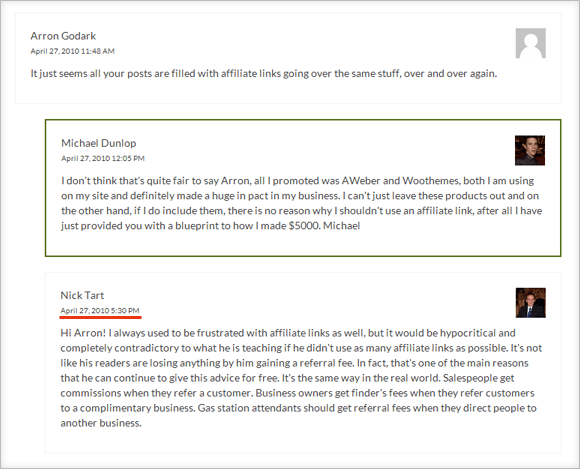 On How I Made $5,000 in the First Month I replied to Arron’s comment because I felt strongly about Michael’s position. This was more than a year-and-a-half before Michael asked me to write for Income Diary. Take that tip to the next level by replying to the author’s reply. This comment will most certainly get read. And since the blogger is already engaged in the conversation, they’re more likely to reply. These are two small tips packed into one. If you don’t have an image next to your comments, go to Gravatar.com, set up an account, and upload an photo. Then use the same email every time you comment on a WordPress site and the image will show up. As the blogger, Gravatars and full names help me remember you. For instance, the first Income Diary commenter that I think of is Jamie Northrup. He’s done a good job of leaving insightful comments on nearly every post I’ve written. Plus, he always uses his full name and he has a memorable Gravatar. I commented on Income Diary 32 times before I started writing for it. The more you comment, the more likely the blogger is to remember you. The more likely they are to remember you, the more willing they’ll be to help. From there, I left 9 more comments before I sent Michael an email. He responded to my email, I interviewed him, met him twice, and now we chat on a regular basis. If you want to be successful online, one of the first things you need to do is start building relationships with other people in your niche. And the best way to start building relationships with those people is to start commenting on their blogs. Tweets get lost. Facebook messages are intrusive. Emails are annoying. Bloggers will always love comments. Really michael, an awesome article explaining everything required to increase comments on any blog. I try to reply to all of the comments that are directed at me, Kelvin. But when bloggers start to get 100+ comments, that becomes impractical. In most cases, they still read every comment but they choose to reply based on those 10 things. Great post. I’m learning a lot from ye guys especially since I’m new to the game. Recently I made my first money online(nothing major but a great start) . Would never have done without the income diary team. Congrats, William! That is a good start. And you’re right, the first people to comment have a higher chance of getting a reply. But I’d be willing to bet that even the A-List bloggers read every comment they get. So, don’t let 75 previous comments deter you from leaving another one. I agree with you William and Nick.. as 3 out of 5 times I received reply on this blog, I was the first one to comment. Interesting, Sam. Let’s kick that ratio down a notch. I would add, don’t shamelessly add in links to your site in the text of the message – people can find you via your gravatar. This is the kind of thing that makes you stand out in a bad way (I’m fresh from hitting the delete button on comments which added nothing except a personal plug). Thanks for the great advice, as always! Yeah, that’s one reason we filter the comments here, Marie. Lot’s of people have a short-term-leave-a-link comment strategy. When, really, the best thing they can do is start building a long-term relationship with those bloggers. Nick, thanks for the tips! As a relatively new blogger I’m sometimes just too plain scared to comment on more popular blogs. But I have to realize that everyone starts somewhere. Also, the more I comment, the easier it gets. Just from the small amount of commenting I’ve been doing recently I have seen a huge return and even though I’ve known how important that interaction is for soem time, your article helps solidify that even more. I’m glad, Sarah. I get nervous too when leaving comments on big blogs. I feel like if I say anything stupid, that stupid comment will be associated with my name forever. But, in reality, bloggers appreciate helping people who are new to the game. And the comments from beginners help them re-realize the problems that their audience face. I encourage you to leave a comment every time you read a post. Hi.. Nick.. !! Good one.. Somehow i manged to get reply from Josh, You, Michael and Tommy.. It feels great to have reply to your comments as a reader. One thing I ll have to mention here is Tommy is the quickest to reply to his readers..
Nick.. one more thing i would like to mention, I came to know Michael and Income diary from your blog. (14 clicks) but for some reason now I don’t go to 14 clicks very often. However i am a very regular reader of income diary now. Anyways.. Keep sharing such helpful information. I’ll work on that, Sam! And good to know about how you found Income Diary through 14 Clicks. I’ve been re-strategizing what I want to do over there. You’ll see lots of changes over the next couple of months. Hey Nick, a totally comprehensive article on getting bloggers to reply to our comments… and, ironically, it’s so complete, I can neither argue with you or think of a question to ask you, except perhaps, How long did it take you to write, lol? From first thought to publish (or rather, Pending Review), it took about 6 hours. I know some bloggers say it only takes them an hour to whip up a blog post, but I can’t do that. Thanks for the compliments, Nic. I’m looking forward to your criticism next time ;). Well, this is a strange situation ! I am Nick replying to you Nick who in turn has replied to another Nick! I was really interested & surprised that it took you about 6 hours to create this post. All of your posts are long & full of content so can you please share your blog post blueprint with us. Where you get your ideas from. Do you still do research or can you now write entirely from experience? I am sure other readers here would also enjoy such a post. Any chance please Nick? P.S. how many blog comments do you leave now? Oh man, oh man… That’s a good suggestion, Nick. I approach every blog post exactly the same way and I suppose I’ve never written about that. You’ll see it here next week! Comments left on IncomeDiary? This is my 303rd. Comments on other blogs? I try to leave a comment on 50% of the posts I read, but only if I have something worthwhile to say. Thank you Nicolas for this useful article. I’m learning a lot from Income Diary about blogging and promotion. Love this site! Just wanted to know, do you feel leaving comments on other blogs with your website url adds value for Google promotion in terms of link building. Does that improve PR etc? Hey Rachna, yeah, I’ve heard that commenting helps boost SEO a bit. But don’t put links to your site within your comments. Most sites link to your site through your name. Links within blog posts to your site, however, are more meaningful. I see commenting, more than anything, as a good way to build a relationship with a blogger. Nicholas, I’ve got to say I’m enjoying seeing your continuing posts on Income Diary and each time, I learn something new, something unexpected. Great examples you were able to show of your different types of comments to Michael over the last couple of years. Was that a strategy to get involved in IncomeDiary or did you just intuitively connect with him? Hey Marion, thank you for the insightful question ;). I’ve commented on Michael’s site for so long simply because I was impressed with what he was doing and I wanted him to know. It wasn’t strategic and I didn’t expect anything from it. Just looking back, I can see how all of those comments helped me get to where I am today. Wow Nick, so young yet so giving. I appreciate your pation to help others learn. As far as your post, I happened to impliment one of your tips by accident and it worked just as you have said here. I wrote a brief story to support the bloggers comment after so many people were not getting the point. I used a story from the Bible but I couldn’t remember the name of the person in the story so at the end of my comment I added: So what was the name of the person in this story? People started guessing. It was great. And I helped people get what the original comment was about. It made me feel good to help and to get recognised so I agree with your blog post. Have a blessed day brother and keep sharing your knowlege. Hey thanks, Michael! Yeah, most of these tips were learned by accident. It’s just a matter of observing what works and what doesn’t. And I think comments have like 500-1000 word limits, so you’re fine. Actually, leaving long comments is another way to earn a reply… So, what was the name of the person in the story? I really loved this post, I’m actually just starting out with my blog and networking around with other people in my niche. It’s all about getting contacts, and if you can get in the blog owners sights, you have a much better chance of creating those essential contacts. This has probably been the most helpful post I’ve seen yet, as it really lays out everything I need to do at present. If only I had come across it earlier lol..! Hey Jack! I’m glad it helps. So, how is Alex Jeffrey’s class? His interview here spurred my first IncomeDiary comment, you know. It’s great, he lays everything out very clearly, and gives you clear steps to take in order to get results. I’M A NEWCOMER TO INCOMEDIARY.I MUST CONFESS YOUVE GOT FABULOUS STUFF GOING. DO YOU TAKE COMMENTS ONLY FROM FOLKS WHO’RE OWNERS OF WEBSITES ? Hey Mona. Next time you comment here, take off the caps lock. Usually we don’t accept uppercase comments, but since you’re new here, I let it slide. And you can comment here anytime, just take off the caps lock :). Hey Nicholas Great idea for others to get noticed commenting on a blog. 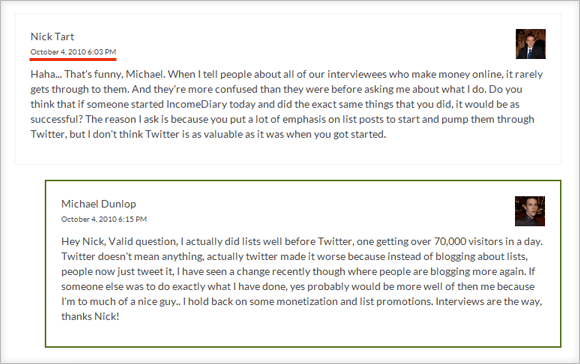 You are a fan first before receiving a chance to blog for Incomediary. That’s awesome. It means you have the perspective of being the reader and now the author. It probably helps you write better articles knowing what you would want to read. Thanks for the tips. Sure thing, Abigail. That’s the main takeaway from this article, leave comments to develop an initial relationship with the blogger. Glad you found it. Nick, I’ve been having a really hard time in getting anybody to comment on my posts. You think is it because of the Disqus comment system I’m using? Because before i added the disqus there was tons of legitmate comments, after i added the disqus system to prevent spam. I started getting very little comments. Hey Ray, yeah, I’d guess it’s the Disqus comments. I understand the benefits of that system to the site administrator, but man, I hardly ever leave a comment on a site that uses Disqus for comments. It’s such a hassle from a user standpoint. Hey Mona, writing in all caps is perceived as though you’re yelling at the reader. Also, it’s a popular spam commenting strategy because it catches your eye. And, yeah, I make a conscious effort to better myself everyday. That’s why I read so much. Hey Nicholas, had this post starred in Google Reader, but was only able to read it today, I’m glad that you think of me when thinking of commenters on Income Diary. I love the posts I read here, I read all the big money and blogging blogs, and this is one of my two favorite ones (SPI is the other). Some of my comments are more insightful than others, but I always leave what I want to say or ask, and I almost always comment on all the posts I read. Sure thing, Jamie. You’re a professional commenter. 😉 I’m also a fan of Pat’s site. I do agree with you that people want to know who they are talking to and adding a Gravatar accomplishes this quite easily. My site is very new, only 3 months old, however, I still have no legitimate comments to speak of. I was wondering if this is normal. If not, then I must be doing something wrong. It could be a number of things, Bradley. When I was first starting about three years ago, I was a commenting fiend. I would comment on nearly every post trying to make connections with people. Eventually those people started coming to my site, and if they liked what they read, then they’d comment. It might just be a traffic issue. I’ve noticed that only about .1% of people who read the article end up commenting. 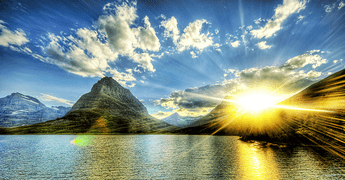 Really an excellent post you have written i was search for this from many times on comments. I’m a new one for blogging and i use to comment only to appreciate that blog what i have read . Appreciation is also a good type of comment right? Looking for reply. I myself try to always reply on all the comments, but I usually end up mostly replying on comments that isn’t just compliments, or questions and statements that hasn’t been said or asked in the comments for that specific article yet. Interesting post! Thanks for the opportunity to comment. Well written and absolutely correct in all you said. 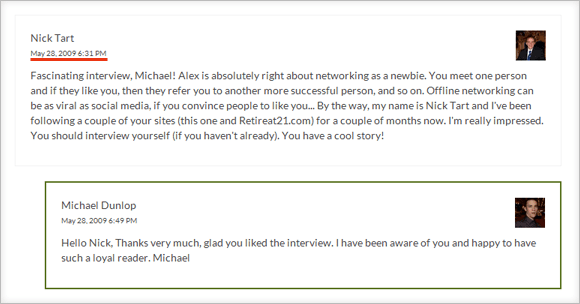 It’s impressive that it took you 9 comments before you sent an email and got an interview with Michael and it took you total 32 comments in 2 years before you wrote for his blog! Clearly this shows you do know his blog and his readers so you know what to write about to get his readers involved. From the comments on your post, this is really happening. Well done, Nick, for a good piece!